Bonnie Adama has created a rich resource of 120 games proven in the classroom to help your fourth grader learn basic math skills. With these skills, your child will be well on their way to success in 4th grade math. Fourth graders have a lot of things they need to practice and perfect. Double-digit multiplication is one of them. “Get to 10” is a great game for helping to achieve that goal. Shuffle cards and place face down in a pile. Each player takes four cards, moves them around, and arranges them to make a two-digit multiplication problem. The object is to make the largest product possible. Players write out their problems and check each other’s answers. 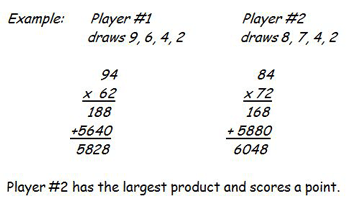 The player with the highest product wins 1 point. The first player to score 10 points is the winner. Variation: Make the smallest product to win. Use calculators to check answers.